I can't believe it's school time again. As many of you know, Stephen is a high school English teacher, so he's already into his school year. But he's not the only member of our family headed back. Our little Ada started her very first year at preschool in a 3-year-old program right down the street. We're so excited for this big milestone, but I can't help feeling a little nervous. I'm a work-at-home-mom, so I've been at home most days with Ada since she was born. It's sort of crazy to think about how many meals I've served her, even since before she was eating real, solid food. In fact, I've been making the vast majority of Ada's nutritional choices, but now that she's gaining more autonomy, she'll start making some decisions all on her own. And when it comes to food, she doesn't always like what's on the plate. We started giving Ada a vitamin D supplement during her first year of life at our pediatrician’s suggestion because our area gets little sunlight during the winter months. Later, we began the adventure of trying to find a multivitamin she might take reliably for some extra nutritional insurance. For us, a multi is important because we're raising Ada vegetarian, but she doesn't always like eating fruits and vegetables despite our urgings. We've been through a variety, settling on gummies because they're the type she seems to like the most for taste and texture. The problem is: A lot of gummy vitamins contain gelatin (including some that I take myself), which we all know isn't vegetarian. The solution? Well, when I found out that L'il Critters™ offers a vegetarian formula gummy, I jumped on the opportunity to give it a try in our home. The L'il Critters™ Fruit and Veggie Gummy Bears contain a blend of 15 different fruits and vegetables with Antioxidant Vitamins C and E. They're made with naturally sourced flavors. And they're shaped like cute bears, which is just for fun. Better yet? They are made in the USA! Ada looks forward to taking her gummy vitamins each day. She even asks for her "bite-amins" after breakfast, which is great because I don't even need to remember to give them to her. And that's the key, right? Healthy habits should be enjoyable so that you’ll keep on doing them -- this rule applies to adults and toddlers alike. So, while there are certainly days when our little girl eats like a champ, I don't need to worry as much on the other days when she'd rather play and push everything around on her plate. 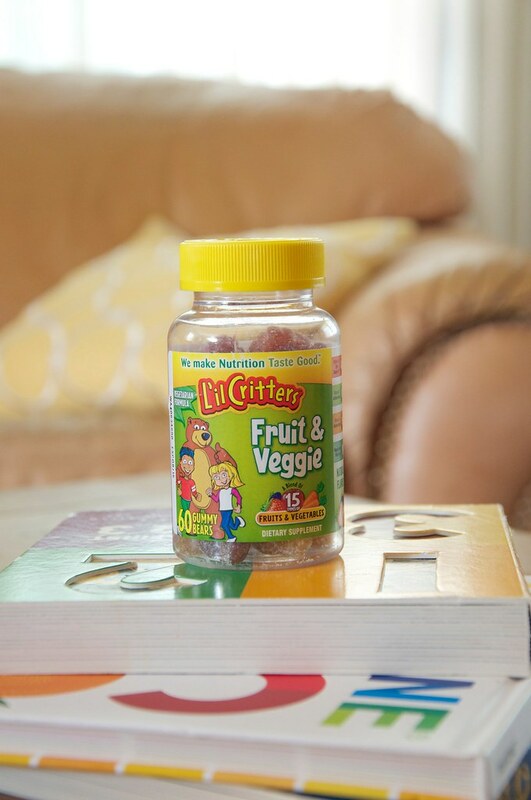 You can find L'il Critters™ Fruit and Veggie Gummy Bears online and at Trader Joe's. You can find more information on these vitamins and others from L'il Critters™ and vitafusion™ adults gummy vitamins here. How do you keep your kids healthy? Leave an answer in the comments below and you will be entered for a chance to win a $100 Visa gift card! This sweepstakes runs from 9/16/14-10/31/14. Be sure to visit the vitafusion™ and L’il Critters™ brand page on BlogHer.com where you can read other bloggers’ posts!